Below is an audio piece I created as part of the excellent Transom Story workshop. After playing this piece at the Listening Event in Woods Hole, the first question I got was “Are you a reporter?” I said no but I did have concerns that the piece had become “newsy”. 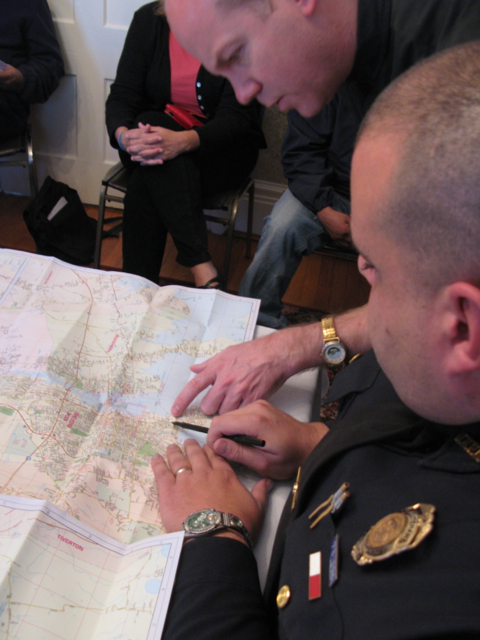 It wasn’t an intimate first person story but I do see it as the story of a government agency (New Bedford’s police) trying to build a relationship with a community of Central American immigrants. From the outset, I was interested in doing something about immigration in Southeast Massachusetts. I have worked for immigrant rights nonprofits for most of my career but I didn’t want to make something that was straight up/in your face advocacy. Initially I wanted to focus on larger political implications around the federal “Secure Communities” program. But my teacher Rob and my classmates helped me refocus on interesting scenes I found, like the police officers’ Spanish class. In fact, I considered making the Spanish class the overall focus of the piece but realized that I needed to bring in more voices. At the same time, I also have this tendency to gather more tape as a way to put off editing. I lucked out by attending the community meeting at Our Lady of Guadalupe and then stumbling on the band practice in the church basement. It was so interesting to me that these two isolated meetings where happening on the same day. Truthfully, if I had had more time, I would have liked to get into more stories like Diego’s or the other instances of violent crime I had heard about. Due to the subject, juggling two languages was part of the production. Even so, I wondered why I chose something that added complexity. Plus here I was showcasing how much work my own Spanish pronunciation needs! At the end of the day, the project really taught me a lot about boiling down complex issues to comprehensible stories. There was much more information to add but there just wasn’t time to gather or include it. While I could have mentioned the “Secure Communities” by name, I liked the way the story mentions the uncomfortable “love triangle” that the federal government plans to create in New Bedford and in other cities around the US. My hope is that the listener wants to know more. Read more from my teacher and classmates here. Apply to attend the Workshop in the spring here.